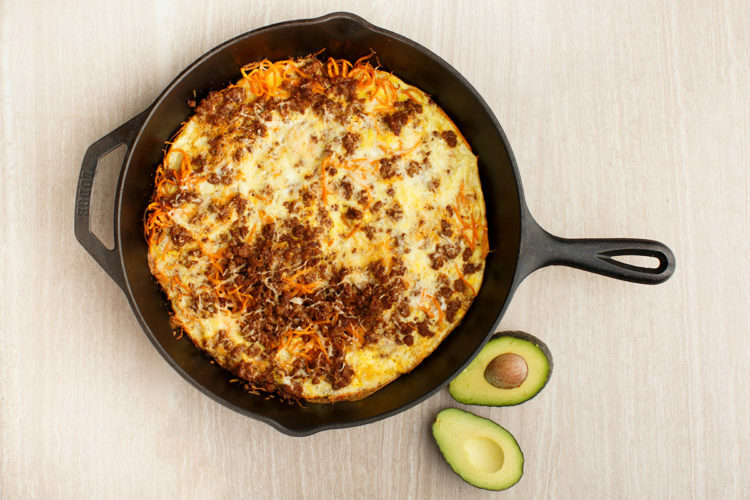 This frittata is packed with chorizo and sweet potato, then topped off with buttery Manchego cheese. Serve with avocado or fresh salsa for a satisfying breakfast or lunch. I’m baaaaack! After a two-month blogging hiatus, I’m reviving my little corner of the internet. Life got pretty crazy once 2018 hit. I was feeling a bit overwhelmed with everything I had on my plate, so I stepped back from the blog for a bit in an attempt to maintain my sanity. I needed the break, but I really missed sharing my latest recipes and adventures with you all. Here’s to getting back in the swing of posting regularly again! This weekend’s weather is pretty awful. Mother Nature keeps teasing us with sunny, 50-degree days. And, then we get hit by snowstorms. Freezing rain is coming down right now, which makes it the perfect day to hole up inside and spend some time in the kitchen. Lazy weekend mornings spent sipping coffee and reading on the couch are my favorites. I love frittatas because they come together quickly, are full of protein and reheat really well. If you’re into meal prepping, this a great thing to make ahead of time for weekday breakfasts. I used spiralized sweet potatoes because they cook more quickly, but you can also use diced sweet potatoes if you don’t have access to a spiralizer or pre-made sweet potato noodles. You’ll have to cook the potatoes longer — about ten minutes covered, then another five minutes uncovered to brown them a bit. The sweetness of the potatoes pairs perfectly with the spicy chorizo. While we had this for breakfast, I love taking frittatas for lunch. Whip up a small side salad, and you have a complete meal! Place 1 Tbsp. of oil in a 10-inch cast iron skillet and heat over medium-high heat. 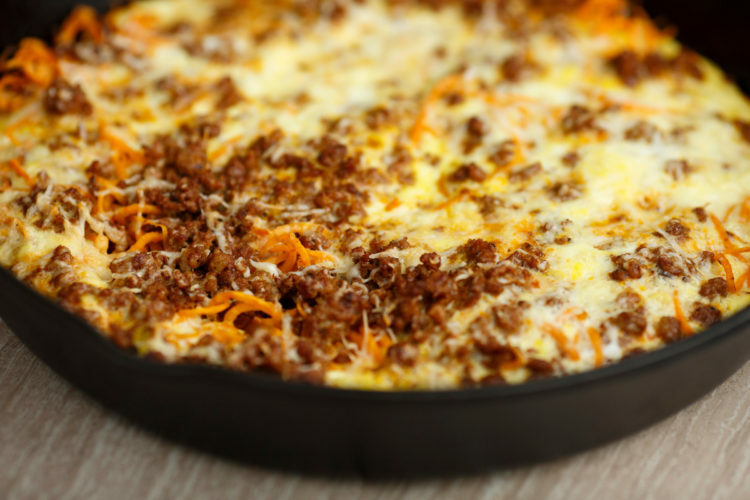 Add chorizo to the pan and use a spoon to break it up into small crumbles. Cook until browned and slightly crispy, about 7 minutes. Place cooked chorizo on a paper towel-lined plate and carefully wipe skillet clean. Return the skillet to medium-high heat, and add another 1 Tbsp. of oil. Add garlic to the skillet and cook until fragrant, about 30 seconds. Add sweet potato to the pan, stirring frequently to prevent sticking. Cook until just tender, about 10 minutes. Spoon chorizo back into the skillet, distributing as easily as possible. Stir cumin, salt and pepper into the beaten eggs, then pour egg mixture evenly over the sweet potatoes and chorizo. Sprinkle grated cheese over the top of the frittata. Cook over medium-high heat until the edges of the frittata are just set, about two minutes. Carefully place the frittata in the oven and bake until the middle is set and the edges are just starting to brown, about 10 minutes. 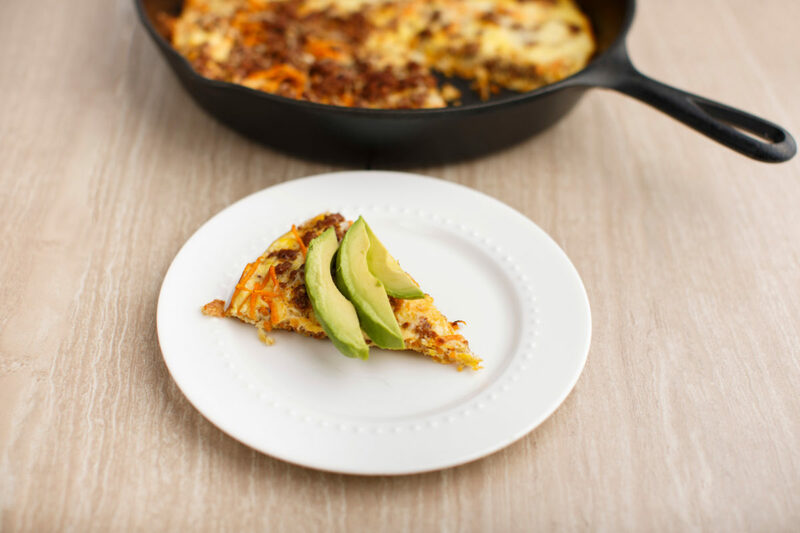 Slice frittata into 8 pieces, and top each slice with avocado.